The moment I stopped talking to a roomful of senior Tata Steel executives in Kolkata some weeks ago, there was an electrifying buzz around the room. I was rather chuffed, thinking that it was because my speech on LGBT rights was so powerful and that we would soon be on our way to making Tata the second gay-friendly Indian conglomerate (after aapro Godrej of course)! I soon realised that on the contrary, it was because the news about the Tata-Mistry spat was just breaking, and everyone was either glued to their phone screen or stepping out to make calls. Fat chance they’re going to care about diversity at the workplace at this point, I thought, so I stepped outside to explore the city I was returning to after so many years. What can I say? Such fun! Such fun! Such fun! “This is a hidden gem,”I squealed to everyone I met during my short visit, while they raised their eyebrows sceptically. But I’m convinced. To me, Kolkata at this moment is where Goa was 15 years ago, before all those sackfuls of Delhi money came and spoilt it all. The perfect susegado vibe. Art. Food. Shopping. It’s all here. Let’s start with the shopping. By now, Kolkata fashion stars like Sabyasachi, Dev R Nil, Kallol Datta, Eina Ahluwalia, Anamika Khanna, Kiran Uttam Ghosh and so many others have established their places firmly in the global firmament, while destinations like Darshan Shah’s Weaver’s Studio and its network of production, research, retail and philanthropy continues to serve as an important node for conversations about India’s textile heritage and future. When I visited, Darshan was in the middle of planning her ambitious Baluchari: Bengal and Beyond exhibition, conference and revival project after showing at Mumbai’s Lakmé Fashion Week. “No time to take a break,” she smiled while calmly managing three clients and two simultaneous phone calls, after making sure I had got my cup of post-shopping chai. I popped into some of the newer fashion spaces like Sulagna Ghosh’s Sienna Store and Cafe, right opposite good old Byloom, a handloom and handcrafted textile store. The New York-educated Sulagna relocated to India to help her mother Shanta expand their indigenous crafts-based brand Sienna that now numbers three independent stores, and a Shantiniketan factory working with Bengali ceramics and textiles. These handicrafts turn up in the store as cool ikat bow ties, silky kimono shrugs, coffee sets and so much more. As I nibble on crisp flatbread covered with olive oil-drizzled babaganoush and pretty much buy one of everything her shop has to offer, she tells me about the renaissance Kolkata is experiencing. 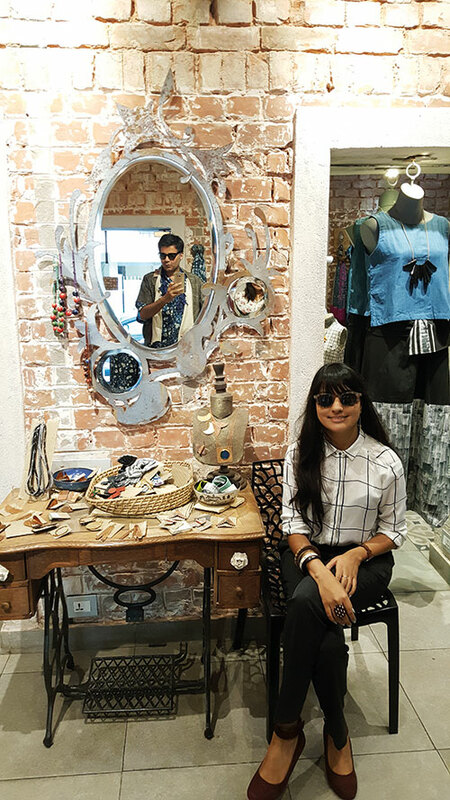 With her hipster vibe, Sulagna could be at home in Berlin or Tokyo, but she’s come back to her roots in Kolkata, as have so many others like her, creating new buzz in town. This creative energy is palpable at Madhu Neotia’s The India Story. 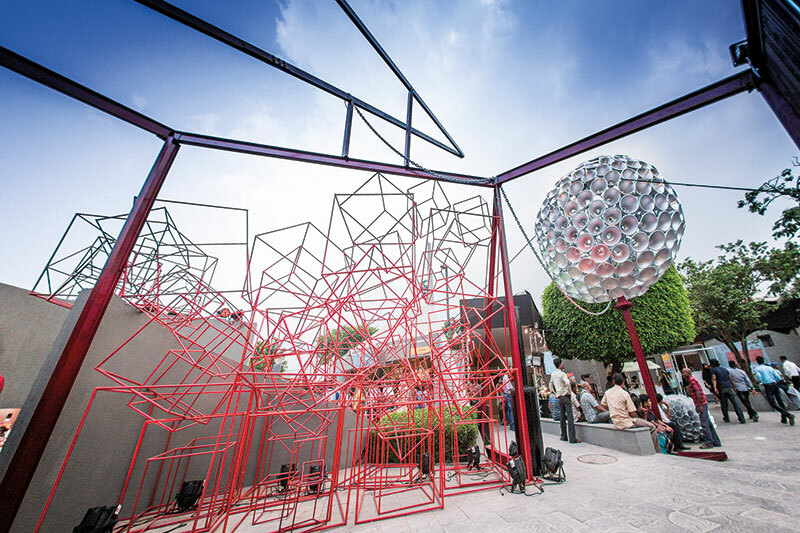 I pay a quick visit to the second edition of the expo, which has already carved a name for itself as a space that showcases the best of contemporary Indian design and arts. The event is beautifully curated — a smorgasbord of designers, artists, craftsmen, performers and gourmet food producers. This is a place where an Antar-Agni from Delhi rubs shoulders with a Jaipur Rugs from Jaipur, where you can buy handmade chocolate and cheese right next to tribal jewellery after strolling through a Nature Morte art outpost, before listening to a fabulous open-air music concert by Parekh & Singh. The crowds thronging the gorgeous Swabhumi are testimony to what a hit this event is. As I pick up a heavenly kaftan from Auroville designer Naushad Ali, I bump into Priyanka Raja from Experimenter gallery — back from one biennale and leaving for another, frantically showing at The India Story in between. The next day, as I visit her art space in its heritage 1930s’ sunken-courtyard setting, I’m moved by the Samson Young exhibition titled Mastery of Language Affords Remarkable Power. In his paper works, Young takes his own handwritten musical compositions, created between 2005 and 2015, and draws, stamps, and colours them, thereby effacing their utility as music scores, and in the process creating something else. Similarly, in his two-channel video on display, the first shows a lion dancing troupe and the second, a string quartet performance. However in both videos, the sounds of the actual performances have been muted — so what one hears instead are things you would otherwise not notice, like the feet of the lion dancers or the breathing of the string quartet members. Young’s attempt to reimagine what is marginal and what is central speaks to me about what I witness and feel in Kolkata almost the entire time I am there. Like with everything else in the city, there’s an easy vibe to Experimenter. I enter, stay for as long as I like. There’s really no rush. I find the same spirit of chill in the city’s hotels. Taj Bengal and The Oberoi Grand have always been around, and I stayed at a posh club the last time I was here but this time, Kallol takes me to The Corner Courtyard — the quaintness of which makes it so easy to fall in love with it. But my discovery of the trip is Floatel Hotel, owned by comedian Anuvab Pal’s dad, Manab Pal. I bump into Anuvab as I stumble out of 6 Ballygunge Place, tummy stuffed with mochar chops, dab chingri and ilish paturi, as if it is the most ordinary thing in the world for two Mumbai-wallahs to hang out in Kolkata; we meet the next day at Flurys with author Sandip Roy (everyone knows everyone else in Kolkata, obviously). Anuvab takes me to his dad’s floating hotel, which was set up in 2004 as the only such hotel in India. It was built in Singapore and floated its way to Kolkata where it now stands on the banks of the Hooghly, in the middle of two rather imposing bridges — the Vidyasagar and Rabindra Setus. As we walk through, I feel a 1980s disco-wallah feeling. The Floatel is slightly rundown and perfect for the next Gucci photo shoot. “Let’s do a fest here,” I tell Anuvab. “Look at Benaras — they are organising Kabir concerts on the ghats! Imagine a trippy music fest with boats you can take from Princep Ghat all the way to the Floatel.” “You’ll have to come back and do this yourself,” Anuvab tells me indulgently. Who knows? Maybe I will. I’ve dicovered my Kolkota chromosome late, I realise, as I bite into a kathi roll while strolling down Park Street, wearing my new silver Chamba Lama pendant. Maybe I will.